PHILADELPHIA (AP) — Barack Obama turned his political attention Friday to Pennsylvania — a state Donald Trump won in 2016. The former president campaigned in Philadelphia with two leading Democrats running for re-election, Gov. Tom Wolf and U.S. Sen. Bob Casey. 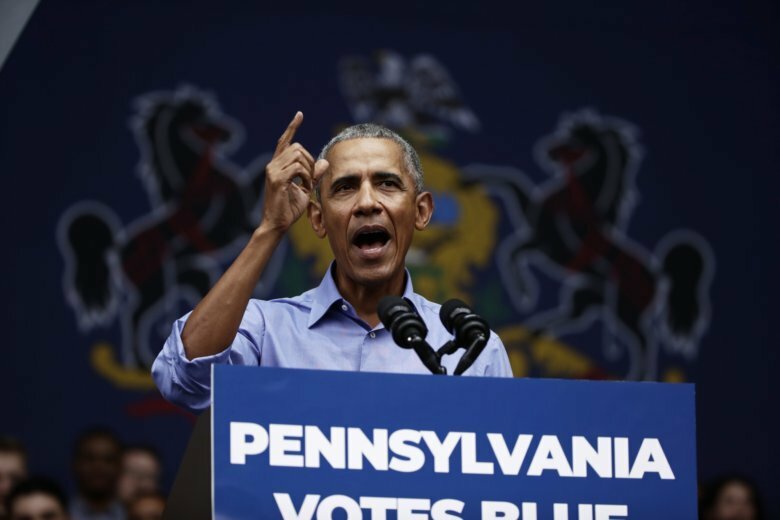 At a campaign rally at the Dell Music Center in Philadelphia, Obama implored Pennsylvanians to vote in November because the election was more consequential than any he could remember. During the speech Obama made no mention of his successor in the White House by name, but urged voters of all parties — not just Democrats — to vote to restore honesty, decency and lawfulness to government. In the Nov. 6 contests, Democrats are trying to oust Republicans in four U.S. House districts and more than a dozen state legislative seats in the Philadelphia area alone. Obama twice carried Pennsylvania in his presidential races, and Democrats hope the state can help them retake control of Congress from the GOP. Casey’s Republican opponent, Rep. Lou Barletta, told The Associated Press that Obama’s visit will stir up GOP voters in an election year when their party faces an uphill battle to retain its Capitol Hill majorities. Obama will “energize those blue-collar Democrats who worried about their jobs under Obama and went out to vote for Donald Trump,” Barletta said. Democrats in other states where Obama has campaigned recently say his stops have drawn big crowds, giving the party a chance to organize, update voter contact lists, motivate new donors and boost volunteerism. Obama planned a fundraiser after the Philadelphia rally. Obama’s trip is the latest in a string of appearances before the midterm elections. While his full schedule is taking shape, aides said he is considering how best to help candidates throughout the country. Obama has endorsed more than 80 Democrats in more than a dozen states. A second round of endorsements is expected this fall.